From across the room, representatives of the international community are gathered. They narrow their eyes, listening carefully and regarding one another with mingled distrust and disbelief ... but enough about the U.N. Security Council. Let's talk about "Disclosure." "Disclosure" was the inevitable clip show episode of Season Six, a relatively easy way for the producers to lessen their workload, give the actors some time off, and spare the budget for more pivotal episodes. The plot was straight-forward and the set simple. 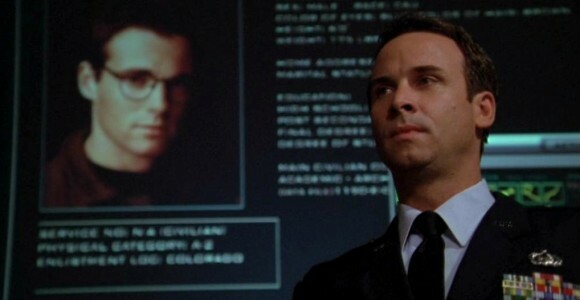 In fact, disregarding flashbacks, the whole of "Disclosure" takes place in a single room in the Pentagon, where ambassadors from the United Kingdom, China and France have assembled to be informed, in detail, about the existence of the Stargate program. The premise of the episode is dual-purpose. First, after almost six years of various craft exploding in orbit and "meteors" falling into the ocean, the idea that these incidents would have gone unnoticed by the rest of the world is doubtful. Cover stories, as any U.F.O. enthusiast can tell you, can only explain so much. And as Hammond points out, the threat from the Goa'uld -- namely Anubis -- warrants a much greater level of military preparedness than currently exists. If a full-force attack is launched, the world must be ready to react. Unfortunately -- as evidenced by the disclosure to Senator Kinsey during the first season episode "Politics" -- the Stargate isn't exactly something that's easy to agree over. Second, explaining the Stargate program and its history to the ambassadors is as good an excuse as any to explain it to the audience. While long-time fans may groan at seeing familiar clips strung together to emphasize simple points, it does give newer or less-focused viewers the opportunity to catch up. "Disclosure" was written under the assumption that Season Six would be Stargate SG-1's last, and recapping the past before heading off to the final episodes isn't a bad idea. It's a better strategy than the one The X-Files utilized; their series finale was a clip show, and the result was hardly satisfying. Of course, "Disclosure" didn't go over every arc from the past five-plus years, sticking mainly to the threat posed by the Goa'uld in general and Anubis in particular. For the most part, new viewers picked up the essentials about why Anubis is dangerous, and what possible defenses Earth has against him, including technology and allies. The question is, can an episode that features only one of the show's main characters -- General George Hammond -- stand as interesting in its own right? Even in "Politics" and "Out of Mind," Stargate's previous clip shows, the flashbacks were integrated into a dynamic cliffhanger-ending storyline ... and they featured the complete cast. "Disclosure" has its drawbacks in that regard; clips aside, it's the only episode of Stargate SG-1 in which none of SG-1 appears. But it also has its moments. The anchor of the episode was General Hammond, who's waited patiently through the years for his own episode. "Disclosure" wasn't that, exactly, but Hammond was still the glue holding the episode together. His reactions to Kinsey's accusations, and his calm interaction with Thor -- excuse me, Supreme Commander Thor -- were the audience's reactions. As the ambassadors express their disbelief, suspicion and occasional snideness, and as Kinsey further riles them up, it is Hammond -- and sidekick Major Davis -- with whom we could identify. The politics, both at the table and behind the scenes, also provided for some amusement. We all know that the Russians aren't working with the S.G.C. out of the goodness of their hearts; wherever you find international cooperation, political and personal agendas are involved. Russia's Colonel Chekov points out to the Chinese ambassador that playing second fiddle to the Americans has its advantages. The S.G.C. puts its lives -- and the United States' money -- on the line, and Russia reaps the benefits. Kinsey is up to his old machinations as well, trying to finagle control of the Stargate by manipulating the British, Chinese and French. However, a timely -- not to mention unexpected and rather impressive -- visit by Thor put a stop to any chance that plan might have had. When a bona fide alien beams into the Pentagon and makes a request ... it's understandably hard to say no.